Amazing Flash to MPEG Converter can help users easily convert flash .swf file to standard MPEG video format with 100% original output video quality. So that you can play SWF files on iPhone, Android mobile phones and other multimedia players or edit SWF files on iMovie, Windows Movie Maker, Sony Vegas, Sony Vegas Movie Studio/Pro, Adobe Premiere Express/Elements/Pro, After Effects, Encore, Pinnacle Studio and etc. It provides single mode and batch mode to convert SWF to MPEG. If a SWF file is not on your local computer, you can download SWF file online directly and save it to local disk. Before SWF to MPEG conversion, you are allowed to crop the flash movie and add watermark, logo, and copyright image onto the created video to mark them as your own, customize video encoder, frame rate, bitrate, video size, audio encoder, channel and audio bitrate. 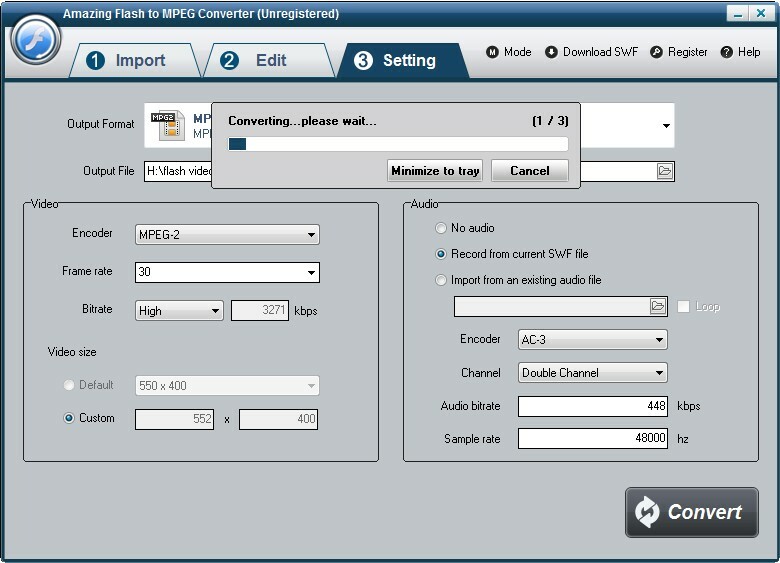 3 steps to convert SWF to MPEG video: step1, launch Flash to MPEG Converter on computer; step2, load SWF files and edit; step3, start to convert SWF to MPEG video format. Angelina - 30X faster than any converter. Blanche - It's easy to convert flash files to MPEG video without quality loss. It is an All-in-one Audio & Video and DVD/Blu-ray conversion application.